A sincere thank you to each and every person that left a comment on my last blog post. It touched my heart. I am grateful to those of you that took the time to share some of yourself with me. Kind words can make a difference in someone else’s life. Everyone has their own scars and challenges to overcome and accept. When it felt like the earth was moving out from under me your words made a difference to me. Let’s move onto some light and frivolous thoughts shall we? Do you ever feel guilty about splurging on something for yourself? I had a discussion with some friends recently and they all agreed that they sometimes feel guilty about splurging on themselves. One example brought up was expensive clothing or shoes. We traced some of this guilt back to how and when the women were raised. In past eras it was deemed selfish to be extravagant and overspend on yourself. I know it’s hard to believe given today’s obsession with over consumption and the masses of enablers we encounter on social media. Two of my splurges that make my life easier are lash extensions and professional hair care. When I was blond I sometimes streaked my own hair (with the help of a willing friend) and it turned out okay. When I went red I tried dying my own hair once, that’s all it took to realize it wasn’t a good idea. I had to spend loads of cash having that catastrophe fixed by a professional. Lash extensions are the only way people can see I have lashes as my eyes are too sensitive for mascara and my lashes are so blond they are invisible. 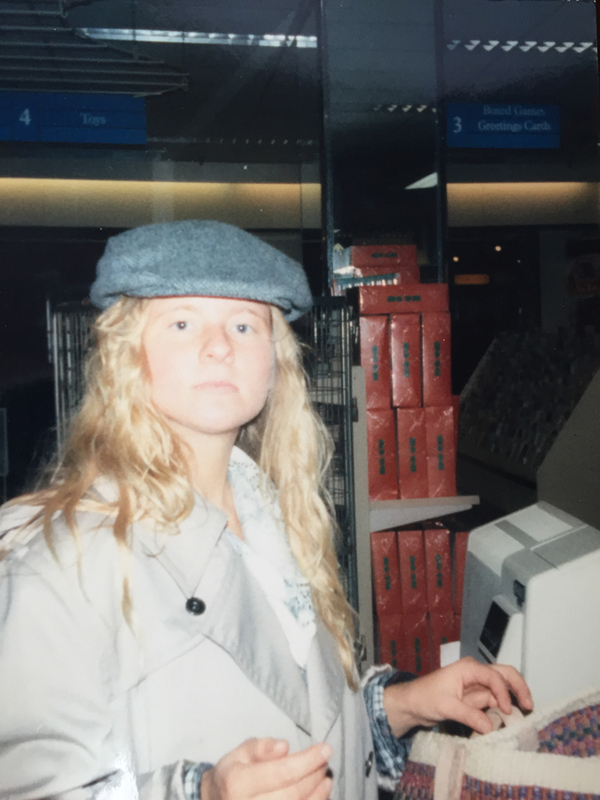 Blond, spiral perm, invisible lashes and a taunt jawline (sigh). Wearing my Dad’s trench he sent over in a care package and a borrowed plaid flannel shirt because I was freezing all the time. Scotland, mid 80s. I don’t spend money on makeup, nails or personal care products. The makeup I wear is probably five years old, or older! (eek!) and from the drug store. I sometimes choose to splurge on comfortable, stylish footwear. If I can find them secondhand it’s even better but it’s not always possible and the older I get the more I’m aware that when my feet aren’t happy I’m miserable. These boots were my last footwear splurge. I bought them at 50% off. I don’t splurge on clothing anymore. Everything I buy is secondhand. Apart from underwear and socks. 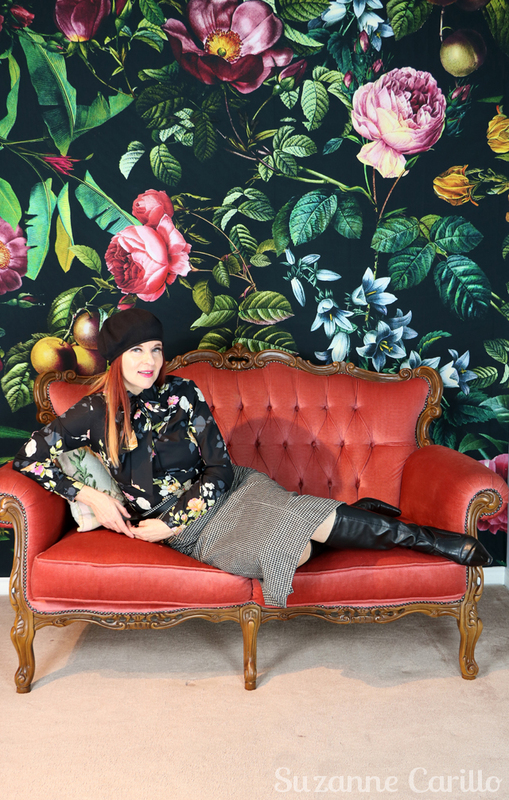 Choosing to shop secondhand aligns with my personal values and helps save our world. Small choices can add up to big changes. Every little bit counts. Skirt and blouse, thrifted. Boots and hat, vintage bought in the 90s. Belt, gift. None of my friends or family live within driving distance and my husband lived overseas for the last two years. Travel at that time was a necessity rather than a splurge. Travel is a priority splurge for me now. The older I get the more I value experiences and sharing moments with family and friends over things. Couch bought at an estate sale. Floral wall mural Society 8. Have your values changed as you age? Do you ever feel guilty when you treat yourself? If so, why? These last couple of weeks have been all about hospitals, doctor’s office visits and coming to terms with illness and aging. Both involve lots of compromise and acceptance. Having lived the past fifty-two years reasonably content with myself and my body my brain is having a hard time accepting this new reality. I’ve done everything right, I’m a vegetarian, I don’t drink, I don’t smoke. When it is nice outside I walk 5km daily and in the winter I try to hit the treadmill a couple times a week with a bit of weight lifting thrown in for good measure. I do fifteen minutes of yoga before bed and fifteen minutes of stretches before I get out of bed. I’ve held up my end of the equation, why is my body not doing its part? 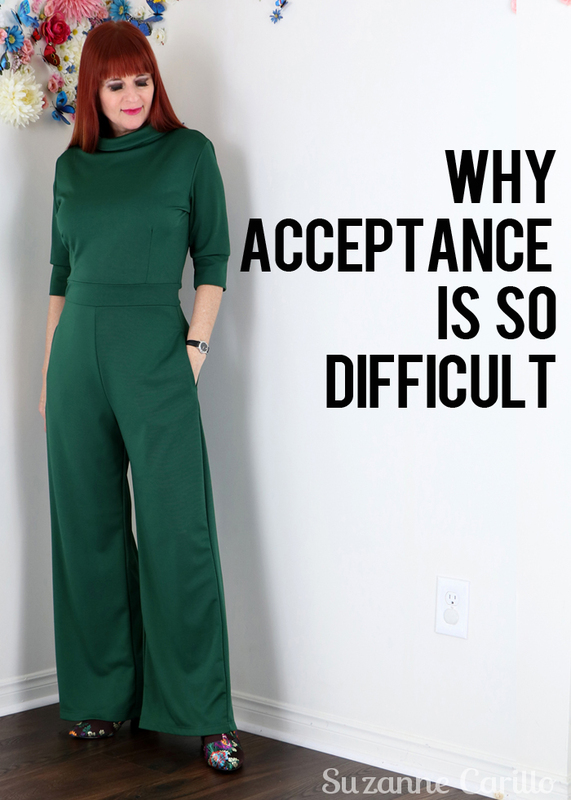 My family physician had a very frank conversation with me yesterday about acceptance and it wasn’t easy for me to hear. I am firmly attached to how I define myself and everything that is transpiring now isn’t part of that definition. As we age our choices diminish and it is difficult to accept. My Doctor pointed out that we can choose to be happy and accepting or we can choose to be angry and sad. How we react to the situation isn’t going to change it. Although I can do my best to help my body ultimately it is doing its own thing and I’m just along for the ride. The Doctor insisted my brain is the magical instrument controlling how well I cope. Suffering, trauma and pain can be filtered through our brain to do less damage. Tapping into the healing and coping capabilities of my mind is my newest task. Meditation has become a priority. There are more tests to be done and I am still clinging to the hope that this will just require a slight shift in consciousness rather than an entirely new definition of self. This unforeseen sidestep has reminded me of my weaknesses and all I’ve yet to understand about aging. I need to learn to accept the things I cannot change while staying positive about what I can change. Focusing on the negative gets me nowhere. People learn to cope, they adapt, they keep putting one foot in front of the other even when they’d rather bury themselves in a mountain of blankets and sleep the rest of their days away. How do you manage to stay positive when difficult challenges beyond your control come your way?